Now, for the botany, bluebells, which were once part of the same family as hyacinths, grape hyacinths and squills, now belong to the huge family Asparagaceae – regrouping plants as diverse as asparagus, yuccas and the infamous houseplant called the mother-in-law’s tongue (Sansevieria)! The classic English bluebell, Hyacinthoides non-scripta, is native to Atlantic parts of Europe, such as the British Isles, Belgium, Western France and Northern Spain. 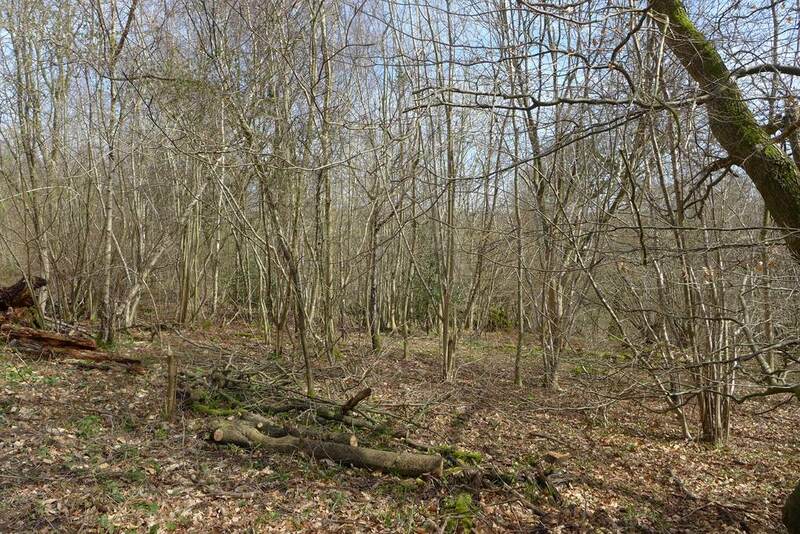 But it’s in Britain that they are are their best, helped by traditional practices such as coppicing (cutting trees every 5-25 years to encourage a multi-stemmed growth), which increase the amount of light available for spring flowers. However, a close relative, the Spanish bluebell (Hyacinthoides hispanica), which was introduced for garden use more than 300 years ago, is menacing the English bluebell. 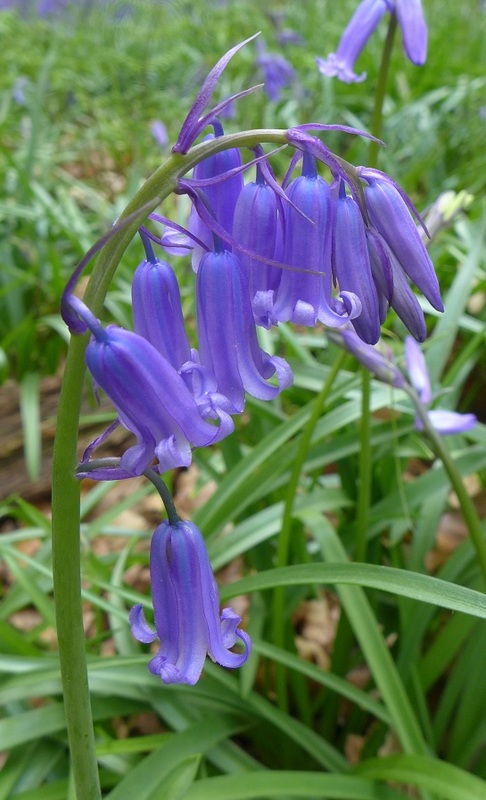 The Spanish Bluebell can be easily distinguished from native blubells by its broader leaves, spreading petals (instead of curled up in the native blubells), two-sided inflorescence (in native bluebells, flowers are hanging from one side), paler colour of the flowers and absence of scent. As the two species are closely related, they cross naturally, producing the hybrid Hyacinthoides × massartiana (incidentally named in honour of a Belgian botanist, Jean Massart!). Hybrids occur regularly in the wild, so why should this one pose a problem? Well, both H. hispanica and the hybrid are more vigorous plants than the native bluebell, and tend to quickly outcompete its populations. The flower colour is similar, so having our native bluebells replaced would not mean a dramatic change in landscape. But the spread of the hybrid means that the genetic material of the weakest parent, the native H. non-scripta, will eventually get diluted into the material of the strongest parent. Such loss of genetic diversity could have terrible consequences if a new disease or parasite invades our woodlands. Previous Post How much biodiversity on a roadside? Thanks for the info, I’m going to link to this from a post I did recently with photos of bluebells in west London. Turns out they were Spanish bluebells. Thanks for the pingback – also very interesting to see your London bluebells post. Colour variation can happen in native bluebells, but it will always be a pale blue/white form instead of the normal dark blue. If you see pink ones, they’re almost certainly Spanish bluebell or the hybrid. Useful to know that the pink variety aren’t native. I’m wondering if these Spanish invaders are not as useful to bees and that’s why I haven’t seen any insects around them. If they are scentless they must be less attractive. Well, they manage to hybridize with native ones, so I guess they are still attractive to pollinators, but you’re right, probably less than our sweet scented ones. Perhaps they compensate the lack of scent by other features though : corolla shape, different flower colour… Spanish bluebells also have distinctive blue anthers (compared to white-creamish ones in natives), which could help. 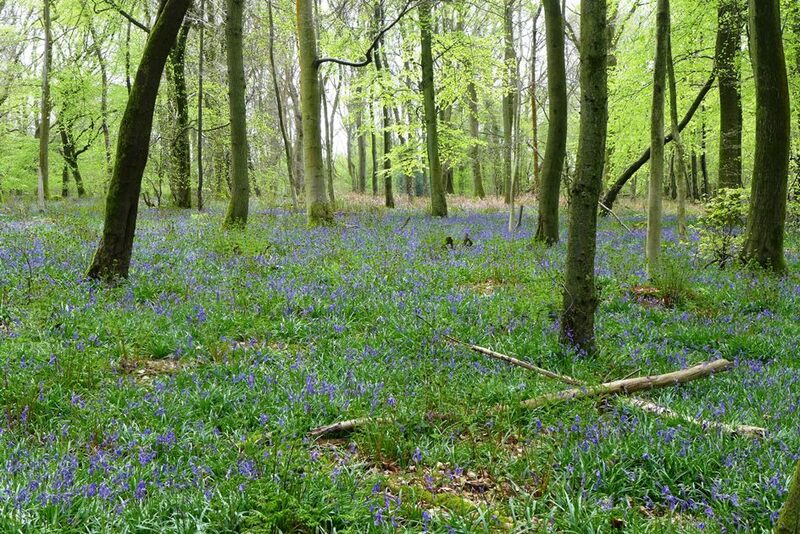 There’s nothing quite as lovely as a bluebell wood in May! A lovely post. I’m still shocked by what I learnt in that first paragraph and I’m still chuckling away from the Mother-in-Law part. White Down has been absolutely gorgeous this bluebell season – they’ve been flowering for a month, and the scent is so heady! A much better year this year than last, even though they were late to bloom. Here’s my post about White Down from a month or so ago, if you’re interested. Oh, that’s lovely! I didn’t live in the UK last year, but I’ve heard a few people say that this year was a very good one for bluebells, although they were late. Last year they were out in early April but they were quite small and sparse and it was a short blooming period. This year a month or so later, but they’ve been bigger, more vivid and have flowered for ages. One of the few upsides to the cold, wet winter and spring, I guess!